It was a snow day and I was home with the kids. I made their traditional breakfast sandwich. English muffins, egg, ham and cheese (Zzzzz). Same way I’d been making it for years. After a few trips to the fridge while assembling breakfast, ingredients kept jumping out at me and I started to get a hankering for something a little more than the boring sandwich my kids were happily gobbling up. This was going to be my fist attempt at Eggs Benedict. But with a twist. With all my years cooking I had never even poached an egg!! Easy peasy. The sauce was more involved than I had expected, but definitely worth it!! I have to say, when ordering it in a restaurant, I NEVER eat more than half and I always take the rest home for the dog. Not this time…I ate the whole thing! Then I couldn’t help but take a long winter’s nap! I will definitely be making this again when I want a treat! I will work on a lighter version in the near future for those of us who like to watch the calorie intake. And for those of you who don’t…stick with this! Yum! 1. In a heatproof bowl over a saucepan of barely simmering water set on medium heat, whisk the butter and egg yolks together until smooth. 2. Very…very slowly, add the 1/2 cup boiling water to the mixture, whisking constantly. (You do not want the eggs to cook). 3. Whisking constantly, heat the mixture until it is thickened and reads 160 degrees on your instant-read thermometer. (It took mine about 10 minutes or so). 5. Gently whisk in the lemon juice, black pepper, garlic salt, sea salt, cayenne and nutmeg. Serve warm. 6. 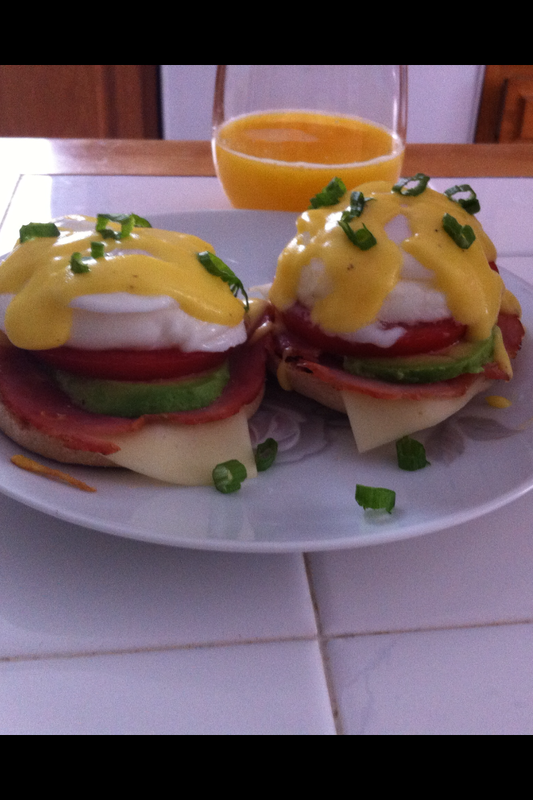 To assemble the Eggs Benedict: Place the 1/2 slice cheese on top of the toasted English muffin. Warm the ham slices in a fry pan and place one slice on top of the cheese. Top with avocado, then tomato and poached egg. Lightly (or not !!) drizzle the hollandaise sauce over top. Garnish with fresh scallions, salt, and pepper, if using. For poaching the eggs add a teaspoon of vinegar to the just boiling water. I used rice vinegar, but I am told you can use any type. This helps hold the egg together while cooking. Use the top lid of a mason jar and drop that into the gently boiling water. Carefully crack the egg into a teacup and then hold the cup at the water’s surface and carefully put the egg in the water over the mason jar lid. The egg should settle right into the lid. Cover the pan and remove from the heat and let sit for four minutes. Using a slotted spoon, scoop the egg and lid out of the water and remove the lid from the egg. A perfectly round and perfectly cooked poached egg! Ta da! !